Well, I finally kicked my ink habit and went back to using gouache. And boy, was it rough. Over the next two weeks or so, I have to complete two pieces for different gallery shows; one in Minneapolis, and the other here in LA. Both are with galleries I’ve never shown at before, so I feel like there’s extra pressure to get things right. Add to that the fact that I have two more shows lined up for January, and there are a few big illustration competitions coming up… I’m so excited that things are picking up, but after a year of few commitments, I’m not looking forward to the crash course in relearning how to wisely manage my time. 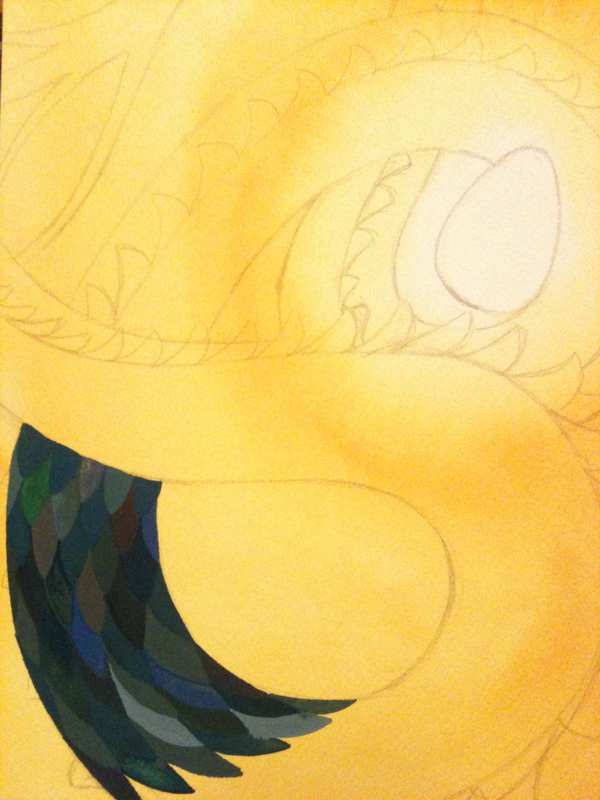 As an exercise, I decided to paint a sea serpent with one of her eggs. This isn’t completely out of the blue. I frequently listen to old radio shows while I paint; one story I listened to a week or so ago was called Toby’s Wonderful Egg. In the story, Toby sees a sea serpent, and finds the egg that she left behind. The only person who believes Toby is the local barmaid; she joins him in his shack and helps him keep the egg warm. When ornery pubgoers arrive to reclaim the barmaid and jeer at this supposed egg, the sea serpent returns to scare them away and reclaim her newly hatched baby. Toby and the barmaid fall in love and live happily ever after. I really haven’t done the story justice, and I highly urge you to listen to it. 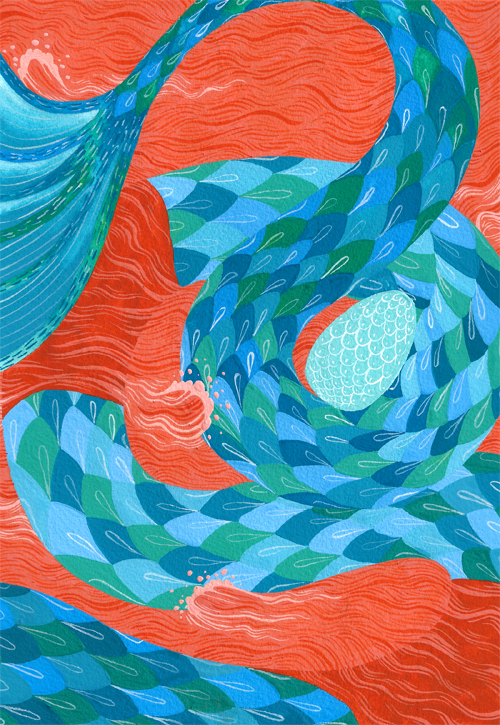 A sea serpent seemed just right to get back into the groove of using gouache. And I totally messing it up on my first try. Ugh. I mean, the drawing is fine, although I didn’t realize until after I started painting that I didn’t want to include spines. But those colors! They’re just… gross. While this attempt was a total disaster, I still really wanted to do the painting. So I started over. Much better! Like always, my scanner doesn’t do me any favors. But this second iteration, right from the get-go, was so much more fun to do. Now that I look at it, I think more attention could be drawn to the egg. But the painting served it’s purpose; I remember how to mix colors, make attractive palettes, do that push and pull you can do with lights and darks that you can’t do with ink. And now I have something to consider turning into a larger project- when time allows, of course. i love the red water and blue serpent and all the details. gorgeous. Thanks! I’m glad the details turned out okay; I was really tired when I did them, so my eyes kept going in and out of focus. Maybe I’ll slow down next time.